The perfect accessory can make or break any outfit. Myself? I'm an earrings girl. I got out of the habit of wearing them when I was completing my Culinary Arts degree (big earrings are a kitchen no-no) but the habit is back full force. Today's Featured Shop has adorable fabric button earrings, and she's just getting started! If you know me, you know of my love of everything purple. Purple pillows, purple clothes, and even (yes, I know, I'm an adult) a purple stuffed hippo. 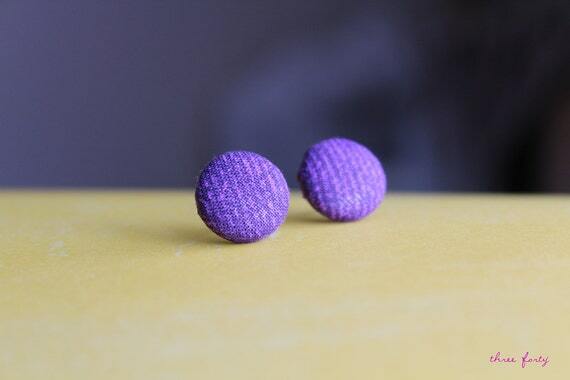 Simple but colorful, these adorable Purple Fabric Button Earrings would easily compliment any outfit you wear. I love the texture; just a plain solid purple would've been boring, but these provide enough detail to make them perfect for any outfit. Black and white combinations are timeless. (Unlike some of the fashions we've seen lately. 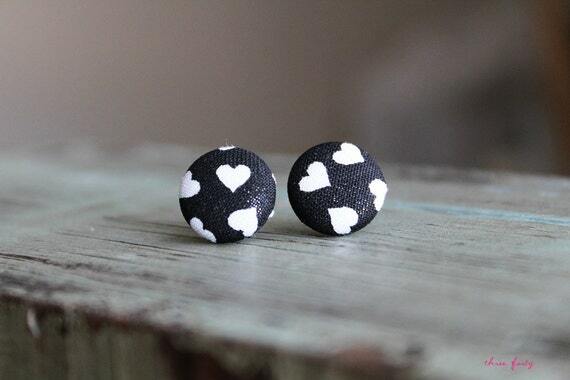 Men wearing skinny jeans still freak me out) ThreeForty's Black and White Heart Earrings are perfect in the fact that they'll literally go well with any color outfit you might be wearing that day...or any day afterwards!